My parents were married on the Friday after Thanksgiving, November 24, 1967. Coincidentally, that date also falls on the Friday after Thanksgiving 50 years later. Daddy had been drafted into the Army that year. He went to Ft. Sill in Oklahoma for training and while there received his orders to go to Vietnam. He called my mom from the payphone at the PX on Halloween and told her the news. Mom, somewhat in shock: "Well, what do you want to do?" Daddy: "I think I wanna get married." And that was that. Less than a month later they got married at Langley Air Force base. It was important that my parents be married because the Army doesn't care about your girlfriend and he wanted to make sure they would be taken care of. My mother wore a light blue velvet dress that her friend made for her. Daddy and Doug (age 8) wore matching suits. Uncle Jack was the photographer, so the pictures got more blurry the more he drank. Daddy left for Vietnam in January of 1968 and was gone for a year. The Army actually insisted on counseling Daddy before he got married because Mom was three years older and divorced with a child. She may have just been trying to get his Army pension (or death benefits). Daddy was insulted. In these days of instant communication, I'm amazed that they went that whole year with only letters. Mom sent a letter every single day. They did get one week in Hawaii for a honeymoon. Friends warned Mom that war does horrible things to a man and to prepare herself that he may not look so great. She said that he was tan, in the best shape of his life, and really happy to see her. Doesn't my mom have great legs?! They had two more children (Perry in 1971 and me in 1977) and would have had more if biology would have cooperated. My parents have disagreed over the years, like most humans do. However, it was always very clear to me that they adored each other, supported each other, and loved fiercely and unconditionally. 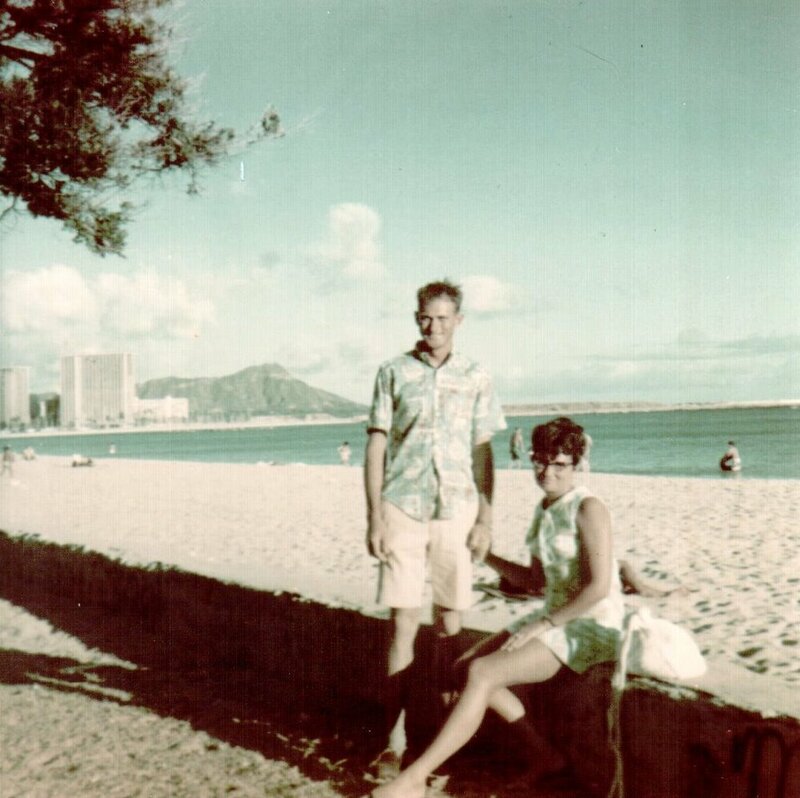 Happy 50th anniversary, Mom and Dad. They're not big on fancy celebrations, but I want to give them credit for being each other's #1 fan, incredible parents, and doting grandparents. "A goat's bite is poison." My granddaddy used to say this on the farm. The last few months it's been one goat bite after another. Nothing heinous. We're not being mauled by bears. Just bite after bite after bite. When Rich went for his immunotherapy treatment on May 6th, he called me and I could barely understand him. He had an allergic reaction to the treatment and it was making him convulse. He couldn't even hold the phone. It passed in an hour and he was able to soldier his way home by midnight but it was very unpleasant. Bite. But hey, we would just pre-treat with Bendadryl on the next visit and he should be fine. Except they did pre-treat and he still had a reaction yesterday. It wasn't as bad, but he still spiked a fever, had the shakes pretty bad, and his heart started racing. At least he could use the phone this time. Bite. Meanwhile, his flight was cancelled so I had to re-book him for a flight today. All he wanted to do was go home and instead he got to go to a hotel in the pouring rain. Bite. The entire month of May, Rich has also been getting fevers every evening. Nothing extreme. 100F or less and they go away in three hours. But it's every. Single. Night. Bite. Rich's shoulder is still frozen. He can touch the back of his head and reach his wallet now but he's still a long way from swinging a sword or hockey stick. He still needs pain meds to sleep. Bite. The pool pump died so we have a 27' duck pond versus a pool right now. Bite. On May 5th, during an attempted run in Georgetown I felt something go "pop!" in my right foot. After several trigger release therapy visits I've finally gone to the sports doctor. I have a partial tear in my plantar fascia so I have to wear a boot for three weeks and then do a month of physical therapy. Two more months before I can run again. Bite. I came to work last Monday (the 18th) and my beta fish Bruce was in very bad shape. I spent an hour changing out the water in his tank and putting him in a fishy ICU. I almost flushed him at several points but he kept moving. I know he's just a $10 fish, but I've really enjoyed his company since I got him in January and I was not looking forward to his demise. I worry about him every day. Bite. I have paid $600 to EZPass (because it was cheaper than going to jail), $500 in car taxes, $600 in insulin pump supplies, and many other little random payments for things I don't even remember. Between my shoulder and Rich's foot, we've been paying $160 a week to the trigger release therapist. Nibble, nibble, bite. Ian has been regularly sent to the office at pre-school for "not listening." Some of it is legitimate obnoxious five-year-old behavior and some of it is just normal kid stuff. But I'm really tired of these super serious conversations with the principal about how he will perform next year in kindergarten if he's climbing up the slide instead of sliding down it. Really. Don't. Care. I emailed Daddy to get confirmation on Granddaddy's saying. I surmised the phrase was because the goat was relentless. I kept thinking of the analogy that a goat has been chomping away at us for a very long time. But he wrote back and said he called it "persistence." That gave me pause. All day I had been thinking of all these little injustices as the goat's bite. Really, the goat is continually chomping away at little things to feed himself and survive. I got Rich first class tickets for his trip home today. Bite. Rich's shoulder is healed enough that he can fight spear. That means he can fight at Pennsic. Bite. I found a replacement pool pump for $150 and it arrives Saturday. Bite. The boot is warm but it actually makes my foot feel better. And I still have plenty of time to train for my half marathon in November. Bite. Ever since that first day, Bruce the fish has been rallying and continues to swim around his little tank. Bite. We paid off the minivan this month and I've found several big ticket items to sell. Bite. Ian finished his last day at preschool on a high note and was hilarious and clever at the dentist this afternoon, including helping them take my x-rays. Bite. If we could find a goat to bite through belly slime, we'd be set. But we'll just keep nibbling away at things with persistence. Who's ready for a post that's not about cancer? So there I was, finishing Rich's dressing change (we can only get but so far away from cancer topics), when there was a panicked knocking at our front door. Our new neighbor Rachel was in her PJs yelling, "The dog's stuck in the fence and he bit me!" I yell back to Rich (who is pantsless but with his wound covered at least) that I'll be right back and go running out the door. I thought their dog was a girl but she said "he" so I was confused. 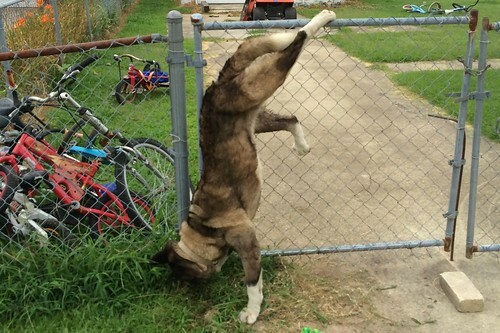 When I come around the corner of her house, it was her next door neighbor's akita stuck in the chain link fence. She had tried to lift him but he was terrified so he'd nipped at her. Thankfully, it didn't break the skin, though she will have a huge "domestic abuse" bruise on her jaw that will be awesome to explain at work. I ran back to our house to get towels and my phone. Rachel called animal control and I called my dad. Whenever my parents' next door neighbor would have issues, they would call my dad for help. She was in her late 70s with young grandkids so there were always issues. It got to the point that when something went wrong (like when one of the kids locked herself in the bathroom), the youngest would yell, "Call George!" I called the house number but no one answered. I called his cell phone but it rang and rang. That's strange because it's always on his belt and he always answers it. Eventually my mother answered it. I blurted out, "I need Daddy immediately!" I heard my father on the other phone line say, "I gotta go." and they just hung up on me. Dad came racing down the street in his 1985 (actually, 1984 maybe?) Vanagon which is like a toolbox on wheels. I ran over to tell him it was the neighbor and not Rich that needed help. He went back to his van for nippers, jumped the fence and clipped it to free the dog. I threw my arms in the air and shouted, "Hooray Daddy!" We got the dog fresh food and water and set him up in his laundry room out of the storm. Animal control came about 15 minutes later and assessed that he could walk fine. They'll leave a note for the owner and I left one as well. But he was smiling and wagging his tail when we left. I thought working from home would be more relaxing.